Yesterday the Wombats turned six months old. Unfortunately the had a rough night leading into their six month birthday. However, when they woke up they were all smiles. They are generally smiley as can be in the morning. They seem delighted to have us wake them up in the morning and take them to day care. Unfortunately we got a call in the afternoon that Martin had returned to his earlier tricks and was screaming his head off all day. This meant we had to divide up. 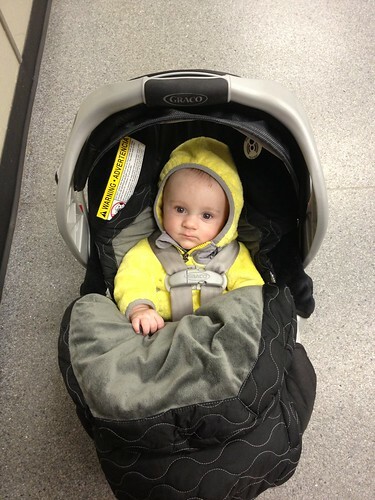 I grabbed Elliott and took him home while Jen took Martin to the late night clinic to get tested out. All the tests came back negative and it was determined that he was suffering from a condition known simply as fussiness. Perhaps he had begun seriously teething. Or, he was just tired of giving his dear old parents a moment of rest each evening. Our planned six month birthday celebration turned into an evening of consoling babies and ended with Elliott eating so much that he exploded vomit like Mount Vesuvius. This resulted in having to mop the floor, give him a full bath, and burn the pajamas he'd been wearing. Tonight I was ale to practice my one-handed knife skills and chop up the vegetables for dinner with one hand while I alternately held Martin and Elliott. This was pretty challenging and ended up making dinner be both late and poorly chopped. 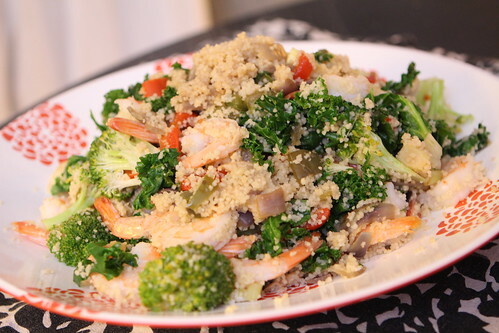 For dinner I made this cous cous with garlic, onion, pepper, kale, broccoli, and shrimp. These were all leftover from meals we had during Christmas and New Year's while Jen's sister visited. When it was done I sprinkled some crumbled feta on top and squeezed fresh lemon over it as well. It was a nice, light dish for the new year. While I'm not the New Year's Resolution type I am the Oh-My-God-I-Can't-Keep-Eating-Butter type. 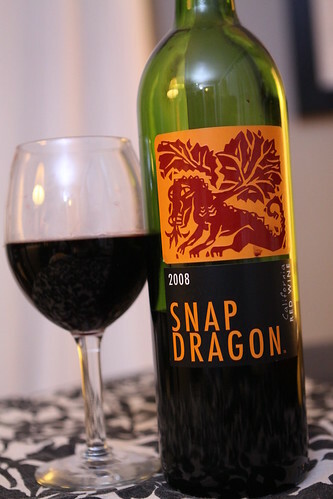 Jen settled back with this 2008 Snap Dragon red wine. 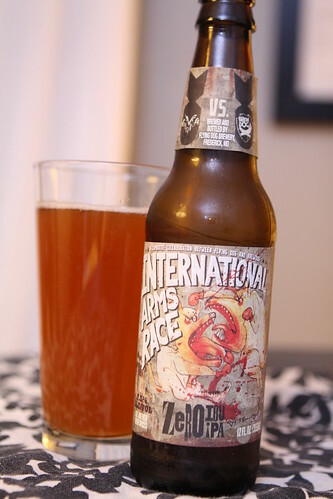 I, on the other hand, had this International Arms Race Zero IBU IPA from Flying Dog Brewery. They had a contest with BrewDog overseas to see who could make the best IPA using no hops at all. This seemed like a very interesting challenge to me so I was very excited to try it. It wasn't all that bitter at all, actually. It was good but not quite what I'd expected. I'd expected them to use something like rosemary stems or something to achieve the bitter taste. This wouldn't be my go to beer every day but it was a very interesting experience that, perhaps, fell a little short because of the expectations I'd built up for it in my mind. 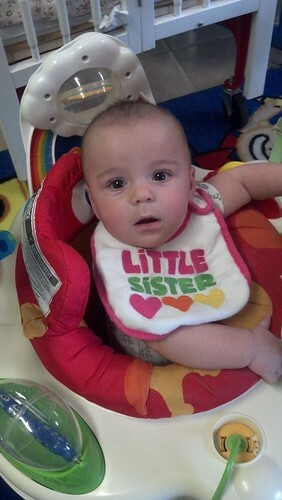 Today we got a picture of Elliott from day care where it looks like they may have been running a little low on bibs. We were happy to see Elliott not feel confined by standard gender roles. It shows a lot of character for a six month old. Elliott scoffs at your standard ideas of gender identity.